Video game villain Wreck-It-Ralph sends his fellow video game characters into a panic and causes chaos when he leaves his game to find a place where he can be a hero and get the recognition he feels he deserves. Movies that bask in nostalgic glory are nothing new in Hollywood. They have made films targeted at Baby Boomer nostalgia for decades by focusing on eras like the 50's 60's and 70's. Now, the tide has shifted towards targeting late Gen-Xers and early Millenials who grew up in a sea of pop culture by watching TV and playing video games. "Wreck-It Ralph" is Disney's attempt to capitalize on our love of arcade gaming and 8-bit graphics. This Disney animated feature is directed by Rich Moore and serves as his feature film debut, though he would go on to direct the Oscar-winning "Zootopia" and will helm this film's upcoming sequel "Ralph Breaks the Internet." 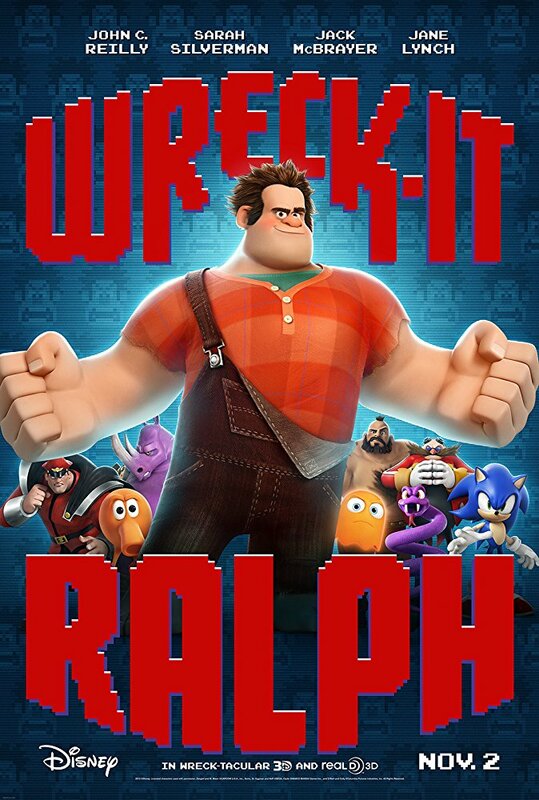 This movie tells the story of Wreck-It Ralph (John C. Reilly), who is the villain of the arcade game "Fix-It Felix Jr." Ralph is a little tired of being dumped on and underappreciated while Felix (Jack McBrayer) gets all the praise and wins all the medals. After being so fed up that he snaps, Ralph abandons his game to look for a place where he can be the hero for once. He eventually lands in a video game called Sugar Rush where he decides to help a glitch named Vanellope (Sarah Silverman) race in the big race so she can become a playable character in her game. 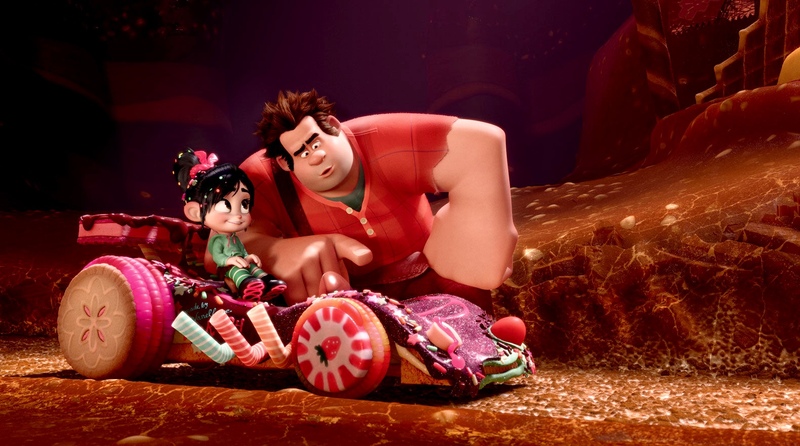 We watched "Wreck-It Ralph" a couple of years ago and felt a little tepid about it. We liked it, but we didn't absolutely love it like everyone else seems to. This is our second time watching it, and we have to say, we enjoyed it a lot more this time around. This is a cute movie with a fantastic message for kids. It teaches children to not let what others think of you control your actions and define who you are. It shows that we are each in control of our own destiny, and we should be who we want to be in life. Granted, this is a message that has been showcased in countless kids flicks in the past, but "Wreck-It Ralph" handles it in a sweet way that doesn't feel too pushy. As with all Disney movies, the animation is splendidly vibrant and super fantastic. There are some wonderful little touches with the way characters from the various 8-bit games move less smoothly in a more jerky motion. These small details and references made this movie infinitely cooler to us. There are also some great cameos by characters from our favorite classic arcade games, including Q-Bert, Pacman, Zangief, M. Bison, and many more. The narrative itself is a little formulaic, but that's to be expected in a kids movie. Luckily, there are many genuine moments that are sure to hit you right in the feels, so that may balance out any qualms you may have about the story being generic. The focus of the story does shift off of the titular character about midway through and starts to concentrate more on Vanellope. Ralph is there to help Vanellope find her place, and in turn, this helps him find his own way. It's sort of like "Road Warrior" or "Mad Max: Fury Road" in that respect, where the main character is there to aid in someone else's heroic journey and becomes a hero/legend in their own right. Finally, the voice work is terrific, and we think John C. Reilly, Sarah Silverman, Alan Tudyk, and Jack McBrayer are all perfect for their respective characters. "Wreck-It Ralph" might not be Disney's best offering, but it is still an enjoyable, fun movie worth watching. Kids and adults will be happy with this one.